AMPM Appliance Repair Malibu has been providing reliable, professional and fast appliance repair service throughout Los Angeles County and the surrounding areas since 1994. We promise no hassles or long waits for an appliance repair technician. We assure that our technicians will come on time to appointments for appliance repair need with excellent & friendly customer service. Our well trained appliance repair technicians in Malibu make us a local favorite. Call AMPM for home and commercial appliance repair company throughout the Malibu and the Los Angeles area. No matter how well you take care of your appliances, they are going to need repairs someday. If you find yourself in need of appliance repair within the Malibu area, we can give you service that every day and we are available at all times. You can depend on AMPM Appliance Repair Malibu to provide those services efficiently and in a timely manner, without disturbing your life and at the time of your convenience. We do all brands’ Appliance repair in Malibu makes and models of refrigerators, freezers, washers, dryers, ovens, cook-tops, stoves, microwaves, ice-machines, air-conditioners, heaters, fireplaces, trash compactors, garbage disposals and dishwashers. We specialize in the repair and service of popular household brands such as General Electric, Whirlpool, LG, Frigidaire, Kenmore, and Maytag, as well as high-end brands such as Sub-Zero, Thermador, Viking, Miele, Gaggenau, Bosch, ASKO, and more. 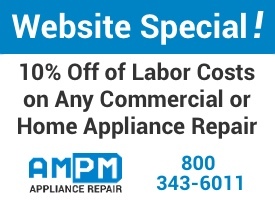 If you need appliance repair or service in Malibu, CA call AMPM Appliance Repair today or schedule online.